The rescue is solely funded by donations from the public and money raised via our Fun Day dog show events. 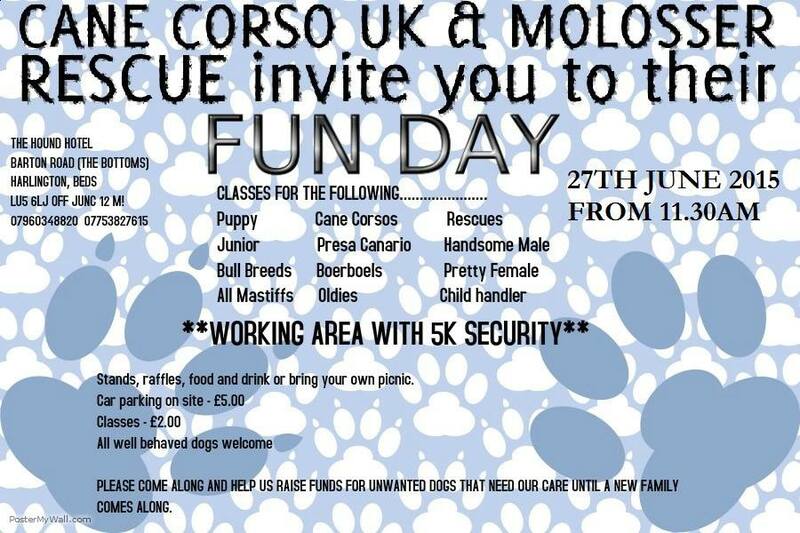 We regularly holds Fun Day Dog Shows to help raise awareness of the rescue and most importantly to raise donations. We also actively encourage our Rescue homes to attend, so that we can see how all our former rescue are doing in their new homes, it also allows you to see the work we as a rescue do. It also give potential Fosterer’s and Adopters the chance to meet the various breeds we rescue and ask the owner what to expect of a rescue Cane Corso/Molosser Breed. To any one that allow’s others to raise money under your rescue’s name please be very careful. We ourselves have unfortunately had instances where our Rescues name has been used to raise money, which sadly never got to us.